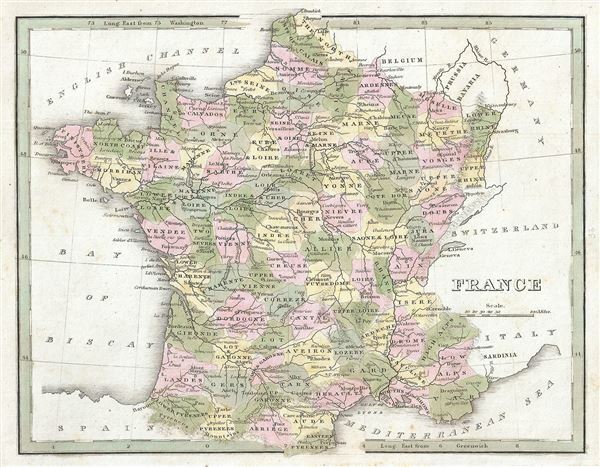 This beautiful map of France was printed by the important American mapmaker T. G. Bradford in 1835. It depicts the Kingdom of France showing its various departments, and covers from the Nord in the north to eastern Pyrenees in the south and from Finistere in the west to Upper and Lower Rhine in the east. Towns, rivers, mountains and various other important topographical details are noted. Elevation throughout is rendered by hachure and departments are color coded. Until 1790 France was divided into 40 provinces based on local loyalties and feudal histories. On March 4th of 1790 the National Constituent Assembly reorganized the Provinces with what the Assembly deemed a more rational political structure. The new department system was intended to deliberately break up France's historical regions in an attempt to erase cultural differences and build a more homogeneous nation. Initially there were 83 departments but by 1800 that number increased to roughly 130. Many of the departments that were created in 1790 remain administrative districts to this day. This map was issued during the July Monarchy, a liberal constitutional monarchy under King Louis-Philippe instigated by the July Revolution of 1830. The July Monarchy would last until the Revolution of 1848 which saw the establishment of the Second Republic. The map was published in Thomas G. Bradford's 1835 Comprehensive Atlas Geographical, Historical and Commercial. Bradford's atlas, published in 1835 was an important work on many levels. First, it was one of the first American atlases to follow an encyclopedic format, offering readers extensive geographical and statistical tables to supplement the maps themselves. Second, it was published in Boston and influenced the city's rise as a publishing center later in the 19th century (at the time most publishing in the United States was restricted to New York and Philadelphia). Third, this atlas was the first to contain a separate and specific map showing the Republic of Texas. Fourth and finally, Bradford's atlas in some instances broke the Euro-centric mold regarding atlas production. Among other things, Bradford focused his atlas on the Americas and abandoned the classical decoration common in European atlases in favor of a more informational and inherently American approach.